Since the year of 1913, Macedonia was divided on four parts. The smallest, went into the borders of Albania. That was the region Mala Prespa with Pogradec and Golo Brdo. The Albanian government hasn't done any colonization problems but there still was violation of their human rights. The Macedonian language was forbidden by the albanian authorities. Also all Macedonian population had to change it's names. The suffix of the Macedonian surname -vski and -ov were forbidden too. Mala Prespa is a region of the albanian side of the Lake of Prespa, where Macedonians live in 9 villages. On the Albanian side of the Lake of Ohrid, with the city Pogradec, ethnic Macedonians represent a majority and together with the colonized Albanians live side by side. 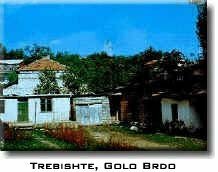 Golo Brdo is a small region in the area near Debar, but from the other side of the border. Here dominant population is the Macedonian of Muslim religion. It is estimated that there are over 280,000 Macedonians living in Albania. Their smallest concentration is in the bordering regions of Golo Brdo and Mala Prespa with Pogradec. The other, large number of Macedonians live in Tirana, Librazhd, Elbasan, Pogradec, Korca (Gorica), Kavaja and Elbasan. 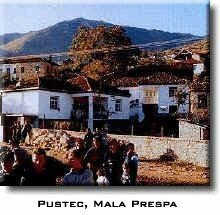 In the region of Mala Prespa, there has been instruction in Macedonian since 1945 in elementary up to 5th grade, for which textbooks have been issued by the state. It is expected that the right to instruction in their mother language, according to international standards, will also be extended to pupils of Macedonian ethnic affiliation in the other parts of Albania. There are several organized and active associations of Macedonians in Albania, but the opportunities for political engagement are small because the state does not financially their organization. It was as late as 1993 that the first periodical in Macedonian, the journal Mir (peace) appeared. Albanian Radio and Television still do not broadcast programmes in Macedonian. There is no instruction in Macedonian in secondary schools. The position of ethnic Macedonians in Albania cannot be compared with that of ethnic Albanians in Macedonia. While in Macedonia, ethnic Albanians (Shqiptare) appears Representatives in the Assembly and their major party is a government coalition partner, the Macedonians in Albanian still have no opportunities for genuine political participation. At present, there are no ethnic Macedonian Members of Parliament, and Macedonians are also not represented in the institutions of state authority and local-self government. However, the situation has changed. The Albanian state lately, has given more rights to its ethnic Macedonian minority. In the part where Macedonians live, there was for the first time used as a coat of arms, of a Macedonian majority municipality (Mala Prespa), the 16-pointed golden sun of Vergina.